Sooooo, season three of Battlestar Galactica was a bit of a mess, but had some redeeming points. Season 4? I don’t even know. I disliked it so much that I’ve never gone back and rewatched any episodes. I suppose if I did, I might find myself liking it better? But then again, maybe not. As I said back in my review of season one, I got invested in these characters. I cared about them. And I feel like almost all of them were completely shat on by the final season. In retrospect, some of this started as early as season two, but it accelerated in season three and was practically intolerable by season four. Characters that were once lovable turned gross. Characters that were once fascinating got boring. Yet others broke so badly and so completely that the pieces were impossible to put back together and it was not a tragedy but a relief when they died. And that’s not even getting into the ludicrous mess that was the series finale. 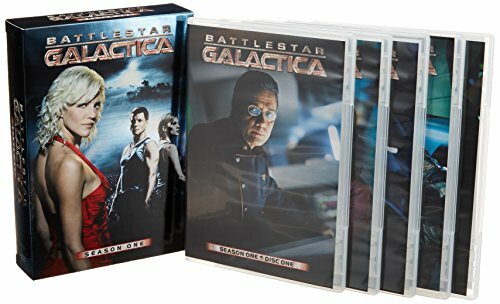 So the question becomes, can I in good faith recommend that people watch Battlestar Galactica when I and a significant percentage of its fanbase were not just dissatisfied but actively infuriated by the final season? Maybe I’m masochistic, but I think the answer is yes. Battlestar Galactica may be a cautionary tale about how badly a great show can go astray, but when it was great, it was really great. As painful as it was watching them fall apart, my imagination would be a poorer place if Starbuck and Roslin and Adama and Six and Cain and Shaw and the rest had never flown in and taken up residence. So, after two seasons of exceptional television by really any measure, season three of Battlestar Galactica is where it started to go off the rails. After a fairly strong start on New Caprica with what is probably the single most spectacular battle scene in the show’s run, the rest of the season frequently floundered. It became increasingly clear that not only did the Cylons not have a plan, the writers really didn’t either. What the plot lacked in logic and continuity, it did make up for in shock value, especially in the killer season finale: “Crossroads, Part 2.” Unfortunately, a few big shocking moments don’t make up for the muddled mess that was most of the rest of the season. The season was partially salvaged by some great character work from the actors, but overall, it was a disappointment. 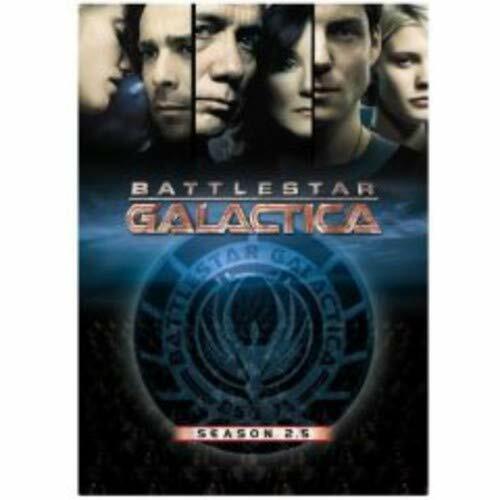 Season two of Battlestar Galactica was just as outstanding as season one. It’s my favorite season of the show, largely because of the intense Battlestar Pegasus arc in the middle of the season, when the Galactica unexpectedly finds another ship that survived the Cylon attacks but has taken a very different moral path in the intervening months. 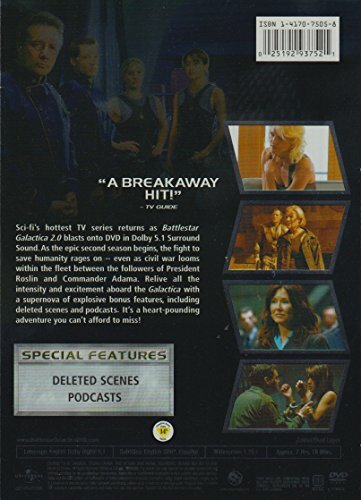 The discovery of the Pegasus was the catalyst for some of the best performances of the whole series, including Tricia Helfer’s as the Number Six copy called Gina Inviere and guest star Michelle Forbes’s remarkable work as Pegasus’s Admiral Helena Cain. 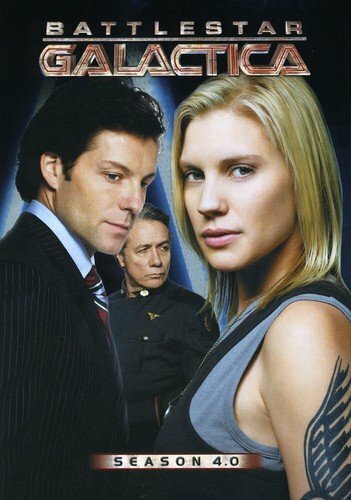 I also enjoyed some of the stand-alone episodes this season, especially the uplifting “Flight of the Phoenix” and the considerably angstier “Scar.” As a huge fan of Kara “Starbuck” Thrace (Katee Sackhoff), I thought this was Sackhoff’s best season, thanks to her performances in those two episodes, the Pegasus arc, and the Caprica arc. 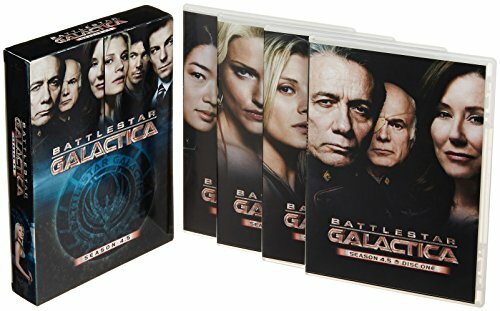 While season two itself is great, I was kind of annoyed that they chose to break it up into not one, but two DVD box sets when they released it. I mean, they managed to fit season one into a single box set and it had the extra three hour miniseries on top of the regular episodes. It kind of seems like a way to charge fans almost twice as much for the same amount of content. Nevertheless, I clearly fell for it, and evidently so did plenty of others, because they did the same thing with season four. 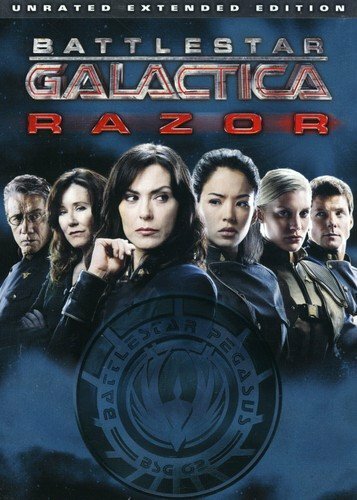 I heard rave reviews of the 2004 Battlestar Galactica reboot for a couple years before I actually sat down to watch it. This was partially because I was confused about where to start, so just in case somebody else has the same question: you start with the miniseries. The miniseries is included with the season one box set, so you don’t need to buy/rent it separately (although that is an option). Once I finally sat down to get started, I was quickly captivated. 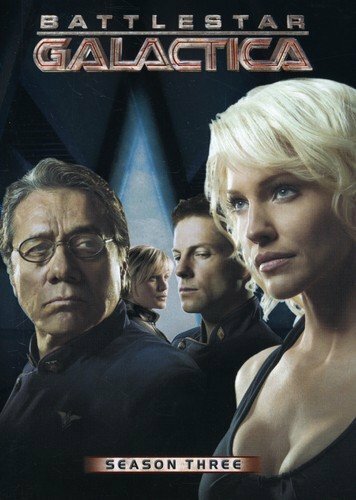 In fact, I think the miniseries and first couple seasons of Battlestar Galactica are some of the best science fiction ever committed to screen. The storyline focuses on the captain (Edward James Olmos) of an outdated starship that is about to be decommissioned and turned into a museum. Shortly before the ceremony is scheduled to take place, the ship’s crew receives word that human civilization is under attack by their former robot slaves, the Cylons, who have attained sentience and turned on their former masters. The massive attack is carried out so swiftly and comprehensively that within hours, the human race is reduced to just 50,000 survivors. Battlestar Galactica never struggled to find its footing, as some shows do early on. The writing in the miniseries and first season is solid throughout, the special effects are excellent, and the large ensemble cast, led by Olmos and Mary McDonnell, is outstanding. Like many great sci-fi series, the show grappled thoughtfully with serious real world religious, philosophical, and ethical quandaries, even as its characters wandered alien star systems in search of a legendary planet called Earth where they hope to find safety. At the same time, it held the interest of less philosophically inclined viewers with gripping storylines and plenty of space battles. For me, one of the main strengths of Battlestar Galactica is its characterization. I thought the writers did a great job juggling the many different arcs and storylines and making each one both individually and collectively interesting and appealing. I quickly grew to care about nearly all the characters and even though I became increasingly unhappy with the direction some of the character’s arcs took in later seasons, I never lost my fundamental investment in the characters and their fates. This turned out to be both good and bad in the end, as I’ll discuss in my reviews of the later seasons, but it was unequivocally a good thing in the miniseries and season one. Not going to lie: eye candy is an additional bonus of the show. I started watching the miniseries one evening without my husband. He passed by the tv at one point and practically got whiplash from Number Six, who is played by Tricia Helfer, a rare model-turned-actress who can actually act. (Grace Park, who played Number Eight, also got her start as a model.) For the ladies, you have Jamie Bamber (though the infamous towel slip is in season two), Tahmoh Penikett, and others.